The location of the previous posting was Kepple Habour Wharf 8 with Pulau Blakan Mati in the background, taken from #5 Temenggong Rd in the late 1940s. Grandfather LAM Song Kee bought #5 and it was my birthplace & childhood playgrounds until 1965. Today the view is blocked by Telok Blangah House and the highway; the warehouses is now Vivocity and Pulau Blakan Mati is Sentosa. #5 was demolished after I left SIN; ruins of the gates’ pillars and the undernourished old rumbutan trees echo memories of a dim grandeur era. From the road one can see a sign State Land No Trespassing posted near the fallen pillars where a magnificent villa once stood on the lush slopes. One can still only reached Mt Faber by a footpath from Temenggong Rd; it is no longer a muddy path, but a paved one with lamp posts. Temenggong and Mt Faber Rds are the few roads in SIN which have kept their charm and serenity. Wed 15 Aug 2007, The Straits Times published an article by Jeanette Wang & Lim Wei Chean titled Mt Faber foothills slated to be next lifestyle hot spot. I wrote to provide them and the Heritage Board with historic info of Temenggong Abdul Rahman who made it possible in 1819 for Raffles to establish a British Settlement in SIN; I also expressed my thoughts as to why SIN does not need to slate the next lifestyle hot spot on historic grounds. March 1823 Raffles arranged for the Temenggong Abdul Rahman who signed the preliminary Treaty with Raffles in 1819 to establish the Settlement and his followers to vacate the village (kampong) at the mouth of the Singapore River and resettle in a new village (Kampong Bahru) in Telok Blangah. This was Singapore’s first urban renewal project. The Temenggong’s new area stretched from Tanjong Pagar to Telok Blangah and covered approximately 200 acres of land. He built his house here and on his new land he grew spices, fruit and gutta percha. He became prosperous. 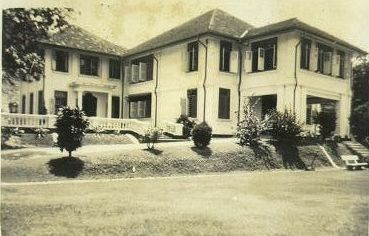 The Temenggong’s Istana (palace) was demolished. Later the Batu Shoe Factory occupied the site. The factory no longer exists but has been replaced by other modern buildings. The present Mosque which belongs to the Government of Johore (Masjid Kerjaan Johor) was previously a reception hall of the Temenggong’s residence. Next to the Mosque on a hillock is the Royal Mausoleum; it includes the royal tomb of the Rajah of old Pahang Johore, Rhio and Lingga Empire. Temenggong Abdul Rahman who died in 1825 is also buried there and the various tombstones in the Mausoleum are indicated in a legend placed against a wall. In front and behind the Mausoleum among numerous other graves is the special bathing area (now covered with dense trees) of Temenggong Abdul Rahman. There was a running stream which flowed from Blangah Hill (Mount Faber) to the bathing enclosure – Dhoraisingam S Samuel.